You may have felt a great disturbance in the Force recently—as if millions of sci-fi geeks’ hearts suddenly trembled in simultaneous palpitation and were abruptly silenced. That “disturbance” was the debut of the second trailer for the new Star Wars movie, The Force Awakens. The seventh episode of the space saga will be in theaters this December. But as we wait for the next scrap that director J.J. Abrams and company decide to toss our way, there’s a way to sate our appetite while going on a little journey “far, far away”—by checking out some of the international locations where The Force Awakens was filmed (or is rumored to have been filmed). Much of The Force Awakens was shot in this legendary studio, continuing the tradition of Star Wars movies shooting in the U.K. In one behind-the-scenes video, director J.J. Abrams gave a rare look at the heavily guarded set and the new Star Wars X-Wing fighter. Since super-secret, big-budget movies shoot at Pinewood all the time, it's off-limits to the public. But the county in which it's located, Buckinghamshire, is roughly 20 miles from London, making it a perfect day trip from the capital to get a small taste of where the sci-fi magic happens. The Star Wars cast and crew were spotted filming on this remote Irish island for a few days last July, which will make it an even more popular tourist destination than it is now. There's a small sixth/seventh-century monastery at the top of the island. 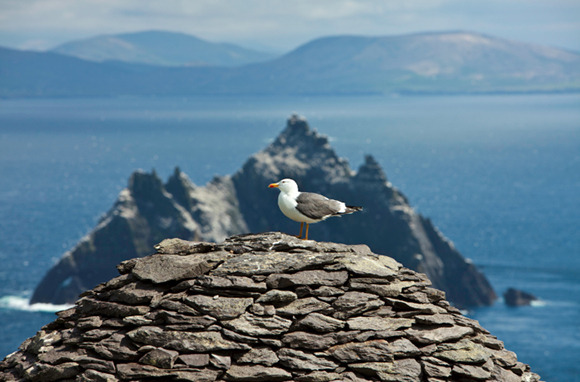 Skellig Michael and its tiny neighbor, Small Skellig, are designated as a Special Protection Area for their nesting areas for rare birds. It's also a World Heritage site. The sand dunes in Abu Dhabi were prominently featured in the new trailer. We now know that they'll stand in for a new planet in the Star Wars mythos, Jakku. And like Tunisia, where the Tatooine scenes from the first Star Wars movies were filmed, Abu Dhabi's Star Wars connection is apparently boosting tourism there. According to the Daily Mail, LateRooms.com has reported a 19 percent increase in hotel reservations in Abu Dhabi, and interest from Star Wars fans is the suspected reason. Any mystery over whether the new movie was filmed here was obliterated when a drone operator flew over this former airbase and snapped revealing photos of the iconic Millennium Falcon and X-Wing Fighters—meaning it was either a film set, or someone out there has the biggest Star Wars model collection ever. Other photos of costume-clad extras were posted online, too. But even if you're not a pilot with the Rebel Alliance, there are still plenty of reasons to see Berkshire: It's one of the oldest counties in Britain, and it's home to the royal family's Windsor Castle. A series of unconfirmed rumors has The Force Awakens shooting scenes here, which makes perfect sense. The Eyjafjallajökull glacier, one rumored filming spot, would be a perfect stand-in for an ice planet like Hoth. And the Myvatn-Krafla volcano region, another rumored filming location, has lots of alien-looking volcanoes, steam vents, and geothermal pools—any one of them a perfect spot to dump Jar Jar Binks. Last summer, a mysterious film crew was spotted shooting in this English woodland, which closely resembles the forest moon of Endor seen in Return of the Jedi. They didn't announce themselves as Star Wars crew while they were filming, but a letter reportedly sent to the cast and crew at the wrap party outed Forest of Dean as a filming location. A wide collection of birds and lush greenery make this a popular destination for walking tours. Maybe you could take your speeder bike for a spin.